Party Line Classic Slot Guide & Review - Casino Answers! 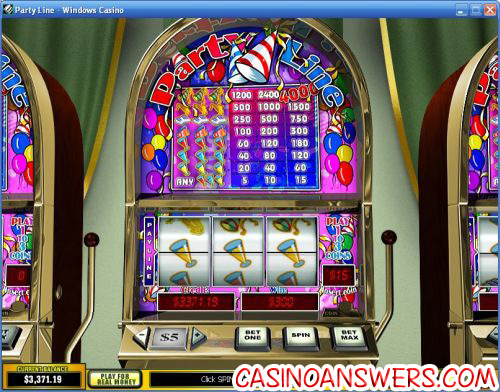 Party Line is a 3-reel, 1-line classic slot machine developed by Playtech. You can play the Party Line classic slot game at William Hill Casino and Cameo Casino. To start playing Party Line, first you must select your coin size. Your choices include $0.05, $0.10, $0.25, $0.50, $1, $2 and $5. Then, use the “Bet One” button to select how many coins you wish to play per spin or simply hit “Bet Max” to play the maximum bet of 3 coins. Spins on Party Line range from $0.05 all the way to $15 per spin. Your total bet will be listed at the right side of the reels. To play the Party Line slot machine, use the “Spin” button. Alternatively, you can also pull the lever to play the slot machine, which is a nice touch that Playtech adds to their classic slots. To win the 4000 coin top jackpot on Party Line, all you need to do is hit three Green Party Hat symbols on the center payline on a 3-coin max bet. If you play the $5 coin size, you can win up to $20,000 playing the Party Line slot machine at William Hill Casino. There are 8 winning combinations on the Party Line classic slot machine. They include (1/2/3 coin payouts in parenthesis): any 3 Drink symbols (5/10/15), 3 Yellow Drink symbols (20/40/60), 3 Blue Drink symbols (40/80/120), 3 Red Drink symbols (60/120/180), 3 Boombox symbols (100/200/300), 3 Keyboard symbols (250/500/750), 3 Saxophone symbols (500/1000/1500) and 3 Party Hat symbols (1200/2400/4000). Hit “Menu” to open the autoplay feature on the Party Line slot machine. If you like, you can just use the basic setting of number of spins, or you can use the arrows on the left side to expand the autoplay feature into its Advanced Mode. Here you can set the stop settings of: Jackpot win, single win more than (up to $99,999.99), overall Win more than (up to $999,999.99) and overall loss more than (up to $999,999.99). You can also set the delay between spins to speed up the autoplay if you wish. Autoplay can be cancelled by using the “X” button. The lowest payout on Party Line is 15X for a 3-coin bet, so you may not get the most frequent amount of wins when playing, but the wins you do get will most likely be significant. To play the Party Time slot machine, make your deposit today to get a 150% up to $300 signup bonus at William Hill Casino! Are players from the United States able to play the Party Time slot machine? Unfortunately, Playtech casinos are unable to accept players from the United States of America at this time. For a party video slot with more of a dance club feel to it, USA players can read our Party Night Video Slot Review or play it now at Juicy Stakes Casino. Where can I read another party-themed slot review? If you are looking for another classic party slot machine with a very similar theme with an even higher top jackpot, you can read our Party Time Classic Slot Machine Review. Where can I play a Flash game of Party Line for free? William Hill Casino and Cameo Casino both offer Instant Play Flash versions of their casinos that include the Party Line slot machine. You can play for free or real money. If you experience any issues with the Party Line Flash game, try installing the latest version of Adobe Flash Player on your computer.